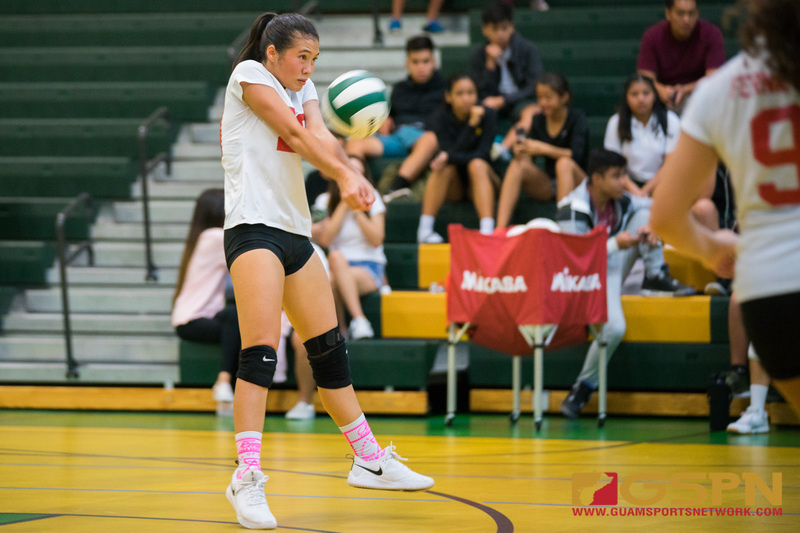 The 2018 IIAAG Girls Volleyball season picked up steam in week two with a battle between the home team JFK Islanders and one of the league’s hottest squads and the unbeaten, AND pre-season champs, the St. John Lady Knights. Hosting St. John’s was no easy task for the pride of Tamuning as the JFK Islanders had struggled to continue their winning streak. The Knights, after battling in the second set, find their rhythm and take the match in 3 suspenseful sets. 25-17,19-25, and 25-15 the result. Undefeated is how the St. John Knights came into their match against JFK and undefeated is how they wanted to leave. Stand-out veteran Hallie Wigsten attributed the victory to mind-set. The Lady Knights out powered the undersized, but spirited front line of JFK. St. John’s sophomore Angeline Del Carmen was dominate up front, stuffing kills while turning in big blocks of her own. The Lady Islanders left the middle unattended through the set, all the while St. John’s found the holes and capitalized. JFK hung around, but just for a bit as the Knights locked in mid-way through and run away with the opening set by eight points 25-17. After the dominating effort the Knights showcased in the first set, there was no reason to doubt that St. John’s weren’t going to come out and do the same . They did just that, until Hallie Wigsten’s serving streaked was snapped after just one point and then the home crowd for JFK got involved. Silenced for the entire first set, the JFK faithful made sure their team knew they hadn’t lost faith, and it worked. Islander Dame Hular caught fire and served with a purpose. Eli Errett for the Knights, tried to shift momentum with a serve that fell short. The Islanders were focused and determined throughout the second to force a third and despite St. John mounting a small rally of the hot serving hand of Yasmeen Lopez, shut down the red hot Knights. Islanders even it up with a hard fight 25-19 victory. Feeling the match within grasp, St. John’s continue into the third set much like they had the first. The Knights dominated in time of possession and it pays off, as they steadily picked apart the JFK defense that seemingly, couldn’t get on the same page. Again, Hallie Wigsten in the hour of need that helped propel the Knights to their fourth win in a row. Third set ends 25-15, Knights. St. John look to put their streak on the line next against the Sanchez Sharks at home.